I can always rely on the fangirls at 24 Headquarters to keep me abreast of everything even slightly related to my favorite TV show while it is off the air until January 2008. They just directed me to a new interview with Mary Lynn Rajskub, who plays everybody's favorite computer genius/social retard, Chloe O'Brien. It was at the Los Angeles premiere of the film version of Scott Heim's novel, Mysterious Skin, a book I had adapted for the stage two years earlier. (I keep telling you: I'm ahead of my time!) 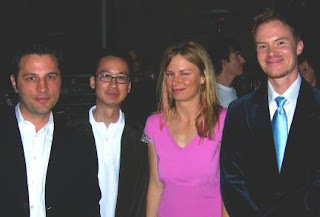 Scott (far right) knew how much Loren (far left) and I loved 24 and obsessed over Chloe's bitterly funny dialogue and unabashed loyalty to Jack Bauer. So Scott introduced us to Mary Lynn, and we gushed at her much like I imagine Trekkies dropping to their knees when they bump into Leonard Nimoy on the sidewalk. It was embarrassing, but we got a goddamn picture. And, as you know, photographs always outlast shame.